Section 1557 of the Affordable Care Act took effect just over two years ago in July of 2016. 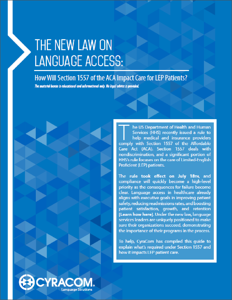 Since its implementation, US healthcare providers have worked hard to meet the language access requirements that Section 1557 lays out. 1. Is your organization bound by Section 1557? Section 1557 also requires covered providers to post a notice of nondiscrimination and taglines (short statements advising language services are available) in the state’s/hospital’s top 15 languages. Find your top 15 languages by downloading Health and Human Services’ PDF. Then download HHS’s free translated taglines, available in 64 languages. CyraCom clients can contact their account manager or client services for access to customizable language notification posters with more than 100 languages and translations available. 2. Are all of the interpreters you use qualified? Demonstrating these skills may require interpreter training, testing, or certification. CyraCom offers staff testing and training for staff interpreters, as well as bilingual doctors and nurses who wish to interpret. We test both language proficiency and interpreter skills. 3. Do you allow patients’ families and friends to act as their interpreters? Providers sometimes turn to patient family and friends to interpret because it’s convenient – often, they’re already present. But emotional involvement and a lack of formal interpreter training may impact accuracy and ability. 4. Are your video interpretation options effective? HHS’s ruling supports using qualified phone and video interpreters to help providers deliver timely language access to their LEP patients. a. “Real-time, full-motion video and audio over a dedicated high-speed, wide-bandwidth video connection or wireless connection that delivers high-quality video images that do not produce lags, choppy, blurry, or grainy images, or irregular pauses in communication. b. A sharply delineated image that is large enough to display the interpreter’s face, arms, hands, and fingers, and the participating individual’s face, arms, hands, and fingers, regardless of his or her body position. c. A clear, audible transmission of voices. CyraCom’s unified phone and video interpretation solutions comply with all Section 1557 requirements. Want a more complete look at Section 1557 and its impact on the provision of language services in healthcare? Download our full whitepaper on the topic to learn more.